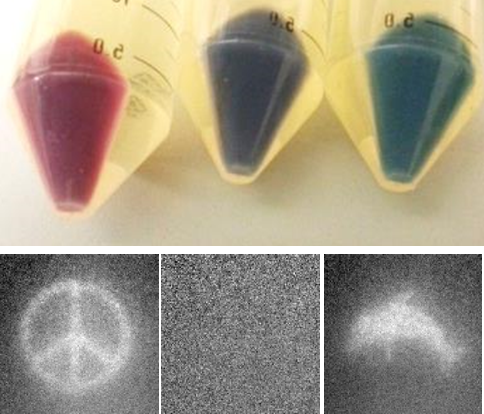 We invent new physical tools to probe biological structures. We use our tools to make new measurements. We choose problems by looking in unexplored regimes of time and space. 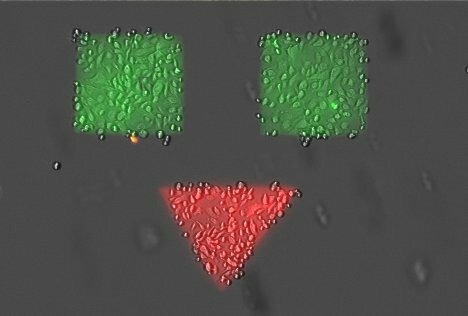 We combine protein engineering, lasers, nanofabrication, microfluidics, electronics, biochemistry, and computers to generate data; and we apply statistics and physical modeling to understand the data. Optically triggered action potential in a rat hippocampal neuron, mapped at 100,000 frames/s. Optical chirality, trapping single molecules, microbial and molecular motion in mucus, nonequilibrium van der Waals forces, DNA mechanics, spectral shift FRET, science education in Liberia. Come develop and use amazing tools to study bioelectrical signaling, membrane mechanics, and other exotic phenomena in biophysics. Please send cover letter, CV, and names of three references to Adam, cohen@chemistry.harvard.edu. Vicente and Carlos developed a beautiful imaging technique that combines structured illumination with Hadamard sequences and compressed sensing. 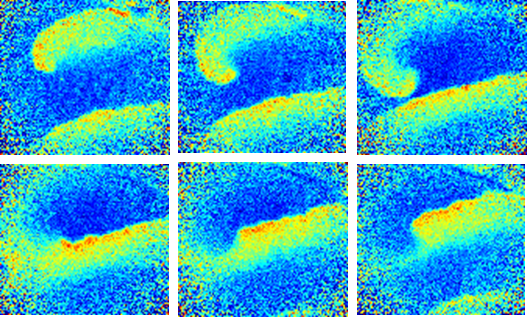 See their paper on Compressed Hadamard Imaging in J. Phys. D. Using one-photon illumination, they achieved high-speed optically sectioned imaging in tissue. Come for the math, stay for the images! Zheng's paper on cell membrane mechanics just came out in Cell. He showed that tension in the cell membrane is highly localized, and propagates slowly and diffusively. This is counter to the widely held view of the cell membrane as a freely flowing liquid: think Jello, not honey! Harry's paper on the geometry-dependent transition between regular spiking and arrhythmia in spiking HEK cells was the cover story in Cell Systems. He showed that even in a very simple excitable cell type, the spiking dynamics are sensitive to the overall tissue geometry through long-range electrotonic coupling. This is a challenge for using human stem cell-derived cardiomyocytes for disease modeling or cardiotoxicity screening. Be still, my beating heart! Linlin's paper on an all-optical assay for synaptic transmission just came out in Nature Methods! She also showed that ketamine induces disinhibition by primarily blocking excitatory-to-inhibitory synapses. Bravo, Linlin! Two labmembers won 'Best Poster' awards at separate conferences this summer. Congratulations to Zheng for winning at the FASEB conference on Molecular Biophysics of Membranes. Congratulations to Yoav for winning at the Gordon Research Conference on Optogenetics and Imaging. Hooray! Zheng's paper is on the bioRxiv! Cell membranes are more like Jello than maple syrup. This was a surprise to us--maybe to you too! Yoav's paper is on the bioRxiv! This heroic piece of work combines new voltage indicators, new microscopes, new mice, and new software. Great team effort! All to see how the hippocampus represents locomotion. Welcome to Yooree Ha and Rajath Salegame. Yooree is working with Urs on voltage imaging in zebrafish vasculature, and Rajath is working with Harry on bioelectrical phase transitions. Welcome aboard! Shane Nichols joins the lab as a new postdoc. He comes from the lab of Bart Kahr where he studied chirality. Shane will be developing a new twist on brain imaging! Kit's super wide-area bidirectional microscope (for imaging and stimulation) comes out in Biomedical Optics Express. Nice job, Kit! Some press here: Science Daily, Harvard's Facebook page. Miao and Daan developed NovArch, a new type of voltage indicator which shows two-photon sensitized one-photon fluorescence. Super useful for dendritic voltage imaging in acute slices. Check out the preprint on the bioRxiv. In this review article with Peng Zou's group we try to trace the family tree of voltage indicators, and to predict where new branches will blossom. See the paper in Current Opinion in Chemical Biology. Hongkang and I discuss the myriad ways bidirectional optical control can be used to enhance drug discovery. Check it out in Trends in Biotechnology! Three postdocs are departing to start their own labs. Daan is starting his lab at Delft University of Technology, and Miao is starting hers at Erasmus University Medical Center, Rotterdam. Xin is starting at University of Florida. Good luck to all! Welcome to Lionel An-Ren Cohen! He is starting to work on data analysis. Kit and Miao's work on optical electrophysiology of hiPSC-derived cardiomyocytes just came out in PLoS One. They combined patterned cell growth, optical electrophysiology and transcriptomics to identify geometry-dependent changes in cardiomyocyte function and gene expression. A news story in Nature describe A news story in Nature describes recent advances in optical probing of neural activity. Check out some vignettes of our work and beautiful photos from Tian and Sami! Join Sami and Adam for a virtual lab tour on Harvard's Facebook Live site. We deal with lots of neuron culture media, but this is our lab's first foray into social media! We wrote a paper describing the amazing optogenetic tricks one can play with spatially, temporally, and spectrally sculpted light. Read about it in Accounts of Chemical Research. Shan developed a transgenic Cre-dependent Optopatch mouse, enabling genetically targeted all-optical electrophysiology in intact tissue. And it's on the cover of Journal of Neuroscience! Harry engineered bioelectric circuits from scratch! Read about optically controlled cellular ring oscillators and other adventures in synthetic neurophysiology in PRX. See also a news story in Physics World. Hongkang's paper showing an all-optical approach for studying ion channel electrophysiology just came out in eLife. Who knew NaV1.7 could be so much fun! Did you remember to celebrate Biophysics Week? In honor of the occasion, Adam wrote a review on Optogenetics, which became the cover story in Biophysical Journal. Robert Campbell's lab developed a red-shifted voltage indicator, and we got to help! Read about in Journal of Neuroscience.